The great season that nobody saw coming. Marvel’s Third Season of “Daredevil” was released on October 19th, and I had the pleasure to binge it in one weekend to write this review. In the end, it impressed in almost every aspect possible. So many aspects of the new season make it a perfect addition to the series. 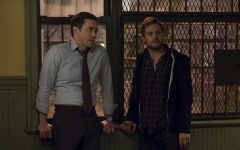 “Daredevil,” which was the first show from Marvel’s Netflix universe, has a history of giving the perfect amount of backstory to the characters that need it. Whether a hero, villain, or side character, the time spent telling the story of every character is exactly what is needed, and has been a staple of the Marvel Netflix Universe as a whole. In Season Three, mob boss Wilson Fisk, also known as “Kingpin,” returns to the spotlight and shows time and time again why he is not only one of the most intricate and intimidating villains in the super hero realm, but in all of cinema as a whole. What makes Vincent D’Onoforio’s Kingpin so special is that he isn’t a unique villain at all. While most villains in superhero stories have some sort of shtick, gag, or a power that mirrors the hero, Kingpin is a normal person, which makes him a more realistic character. While Kingpin is normal on the surface, one of his only defining qualities is how he goes about winning his battles. He doesn’t want to take over the world or enact his revenge, he is driven by pure greed. To maintain his greed, he goes after his enemies family, friends and communities. While he can’t physically take most heroes in a fight, he has cards to play that can let him ruin their lives in a hundred other ways. All these unexpected moves by the villain lead to some intense plot twists, which the show doesn’t seem to have a shortage of. The third part of what makes Wilson Fisk so incredible of a foe to go up against is that he always wins. No matter how long he is locked up for, beaten, or brought to his knees, he is ahead of the situation, and is ready to turn the tables on whoever is challenging him. 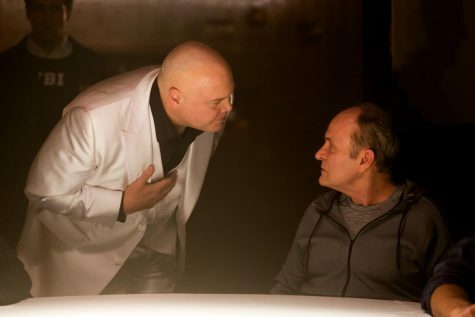 While Wilson Fisk is a returning character, the Marvel Netflix shows tend to utilize their long format by featuring two separate villains that each pose a threat to the hero. The second villain, new to the universe, is one of Daredevil’s most notable arch enemies: Bullseye. 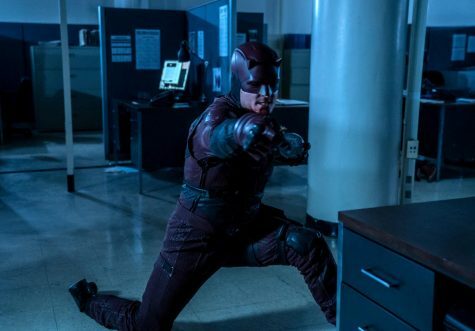 The last time Bullseye was seen in live action was in the abysmal, horrible and flat out horrendous 2003 film Daredevil, where Ben Affleck and Colin Farrell duke it out in tight leather suits. This time around, Bullseye is played by Wilson Bethel, who does the character justice. While Kingpin is the “king” of villains, Bullseye is more of a pawn, being used by other characters until breaking off onto his own. His backstory is somewhat tragic, as well as something that puts the viewer on edge. The character as a whole is complicated, and Benjamin Pointdexter, which is his real name, struggles through his own problems as well as creating them for the other players in the game. While is is rare to see a character that seems to be born for a role, this show has several. Charlie Cox, who portrays the titular Daredevil, is one of the most impressive actors in any role that I have seen. From the playful and fun moments that he shares with his best friend Foggy, to the sensational fight scenes, it seems like he can do it all. Charlie Cox performs almost all of his own stunts for the show, which includes getting beaten up and crashing through tables. Several fights are one take tracking shots, which lasted well over five minutes, and are visually stunning to watch. 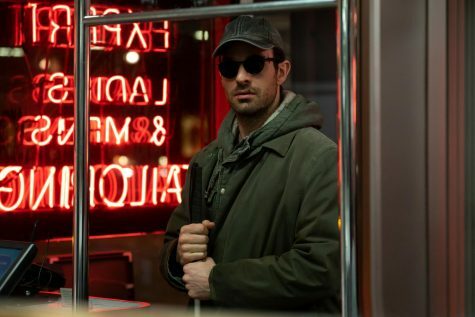 Another impressive fact is that while Matt Murdock is blind, Charlie Cox isn’t. 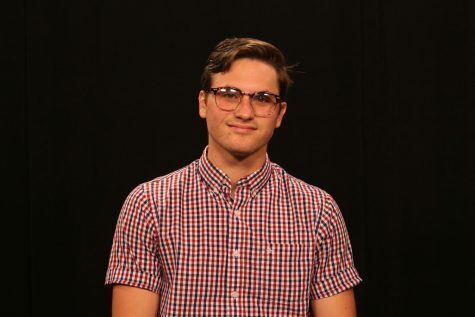 This means that Cox had to be trained to act like he was blind, and after watching his exceptionally convincing portrayal, it is hard to remember that the actor can actually see in real life. Lastly, the action that the show was known for in its previous seasons not only returned, but came back with more punches kicks and flips than I thought possible. Specifically, the fourth episode, which is titled “Blindsided,” features the longest one take fight sequence in modern film history. Most fight scenes cut up their takes, and move cameras around for different angles. However, this entire scene, which is almost 11 minutes long, was done in one single take. 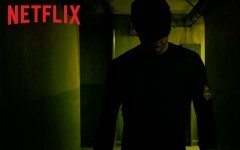 The camera moves through the labyrinth of a building following Matt Murdock while he fights his way out of a prison riot, and shows dialogue that alters the plot of the show in immense ways. While two of “Daredevil’s” counterparts, “Luke Cage” and “Iron Fist,” have just recently been cancelled, the third season is such a masterpiece of a show that Netflix would be crazy to ditch. 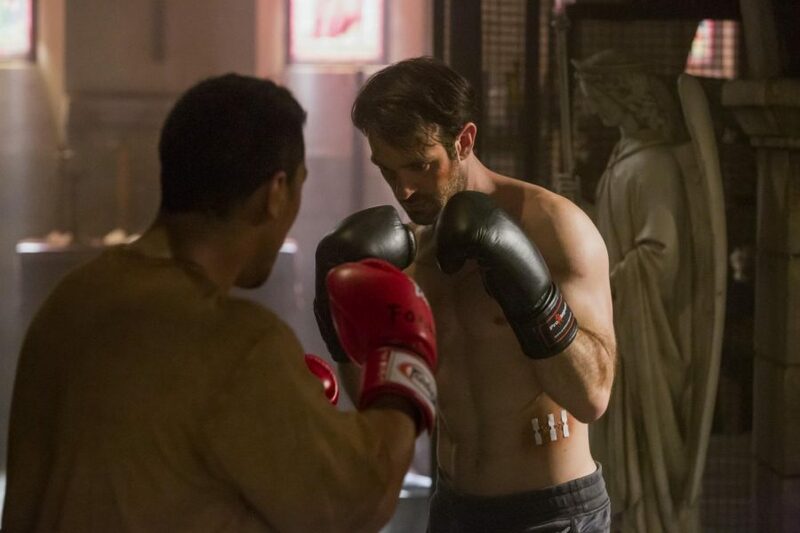 From the intense choreographed fights, to the characters that draw you in emotionally, if you are a fan of live-action adaptations of comic books, then Season Three of “Daredevil” is required viewing.